w = chebwin(L) returns an L-point Chebyshev window. w = chebwin(L,r) returns an L-point Chebyshev window using sidelobe magnitude factor r dB. Create a 64-point Chebyshev window with 100 dB of sidelobe attenuation. Display the result using wvtool. Chebyshev window, returned as a column vector. If you specify a one-point window (L = 1), the value 1 is returned. An artifact of the equiripple design method used in chebwin is the presence of impulses at the endpoints of the time-domain response. The impulses are due to the constant-level sidelobes in the frequency domain. The magnitude of the impulses are on the order of the size of the spectral sidelobes. If the sidelobes are large, the effect at the endpoints may be significant. For more information on this effect, see . The equivalent noise bandwidth of a Chebyshev window does not grow monotonically with increasing sidelobe attenuation when the attenuation is smaller than about 45 dB. 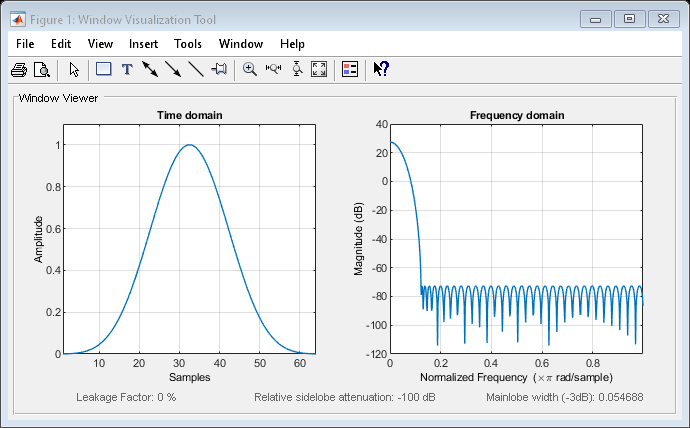 For spectral analysis, use larger sidelobe attenuation values, or, if you need to work with small attenuations, use a Kaiser window.